This paper discusses academic mobility in Brazil over the past few years due to the increase in governmental initiatives to promote internationalization of higher education and student mobility. The aim is to address the challenges faced by the international academic mobility program Science without Borders (SwB) to boost the development of science, technology and innovation in the country. To live to this expectation, SwB fosters foreign language learning as a key element to the program’s success. Known as the most expensive investment ever made in the country towards funding international mobility in higher education at the undergraduate level, Brazil is aiming high in the program. Whether or not the SwB generation will fulfill the task to transform science, technology and innovation in the country in the years to come is one of the questions raised by the study. Drawing on an analyses of qualitative data with undergraduate students, participants in the SwB program from 2011 to 2014, the paper discusses three important dimensions of the international mobility: (1) the contribution at educational and professional levels; (2) the contribution at a personal and subjective level; and (3) the importance of foreign language acquisition to broader education. The results support the argument that the SwB generation has developed, as its most salient aspect, a differential self-perspective after undergoing mobility and stress the importance of a more inclusive, multilingual language policy for the country. Professor Jean Marc Dewaele, Birkbeck College, London, UK Professor Ofelia Garcia, City University of New York, USA. Finardi, K. (2014). The slaughter of Kachru’s five sacred cows in Brazil: Affordances of the use of english as an international language. Studies in English Language Teaching, 2(4). ISSN 2372-9740 (Print) ISSN 2329-311X (Online). www.scholink.org/ojs/index.php/selt. OECD (2013). Education indicators in focus. http://www.oecd.org/education/skills-beyond-school/EDIF%202013--N%C2%B014%20(eng)-Final.pdf. Tollefson, J. W. (2015). 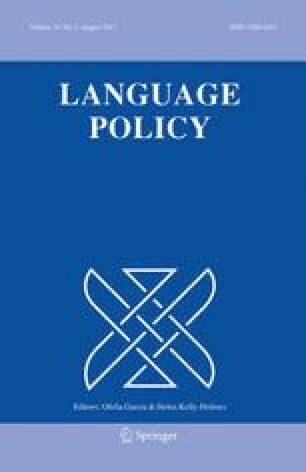 Language education policy in late modernity: Insights from situated approaches—commentary. Language Policy. doi: 10.1007/s10993-014-9353-8.